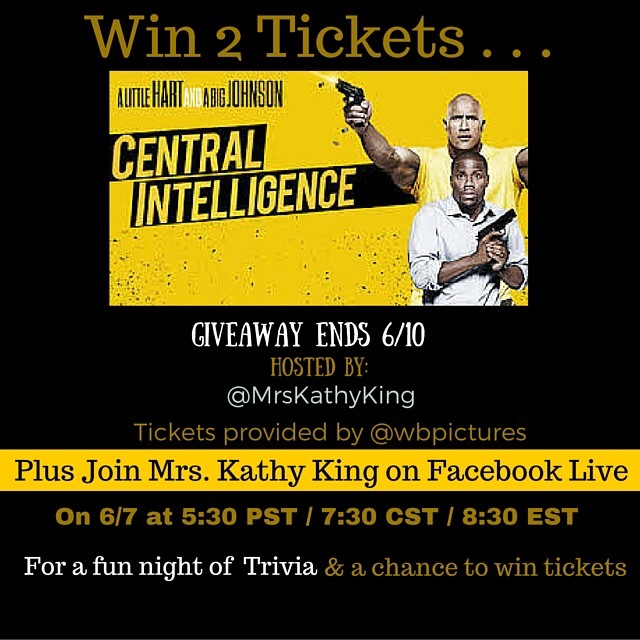 Giveaway:Win two tickets to Central Intelligence! If you love Dwayne Johnson and Kevin Hart we have a giveaway just for you. We’ve teamed up with On the Scene with Mrs. Kathy King for an awesome giveaway. We would like to give two lucky fans 2 tickets to see Central Intelligence starring Dwayne Johnson & Kevin Hart. I love both actors, so I can’t wait for this movie to come out! # of Winners: 2 Lucky Fans!!!! Plus Join me Facebook Live on 6/7 at 5:30 pm (PST) for an extra chance to win tickets!!! This entry was posted in Giveaway by Melissa. Bookmark the permalink.